Would you classify yourself as a woman that is deeply principled? To me, rooting yourself to fundamental truths offers you the the greatest ability to live a disciplined and self-controlled life. I believe being highly principled is not just about what you WILL do, but more importantly, about what you’re UNWILLING to do. When I am living by my deeper principles, I am not controlled by the whims of my emotions. I am controlled by my deeper desire to do what is RIGHT. 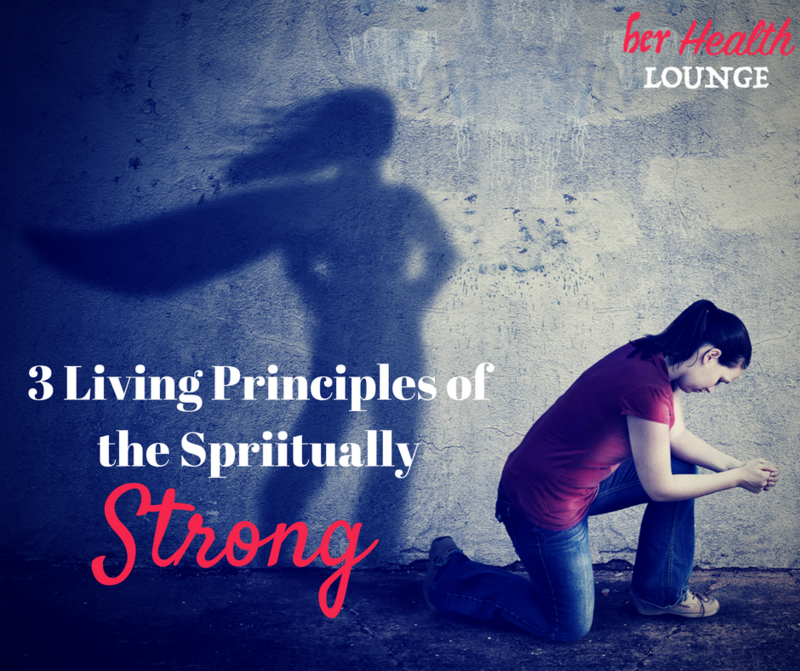 It’s the Spiritual connection to my actions and how I am to live Spiritually strong. In my health coaching practice, all of what I offer you and teach you comes from some basic Spiritual principles. These have evolved as I have grown in both faith and intellect regarding our health. They are vital to every fiber of my programs. Everything that you see in the her Health Lounge program all aligns with these 3 principles of True Health. I believe when you understand these principles and entrust them to your Spiritual practice, they will transform your health and give you the STRONGEST Spirit you will ever see. It will also give you a chance to see if these principles align with yours so you can determine if the h2L is the right program for you! If you’ve followed me for any amount of time, you may have seen me use this sequence of growth we see in our lives. Your identity is the “BE” of this sequence— it is your BE-ing. Everything that that you think everything that you speak and everything that you do comes from this conscious and subconscious identity. Too often, I find that women identify themselves more from their WEAKNESSES than their power. We as humans very easily only focus on our flaws, don’t we? We limit our actions to what we *think* we are capable of doing through these perceived limitations. Our weaknesses do not limit God at all. So it’s not in what YOU KNOW but rather WHO YOU KNOW. Knowing God makes your weakness rather irrelevant. Know how much He loves you and accepts you just as you are give you a brand new identity and brand new power to SAY THINGS and DO THINGS beyond what you feel capable. Knowing God means that you know the POWER that is at work within. You CAN do ALL THINGS through Christ who strengthens you. (Phi 4:13). This is the true confidence that will transform your life and help you look BEYOND your “health goals” to a higher calling. 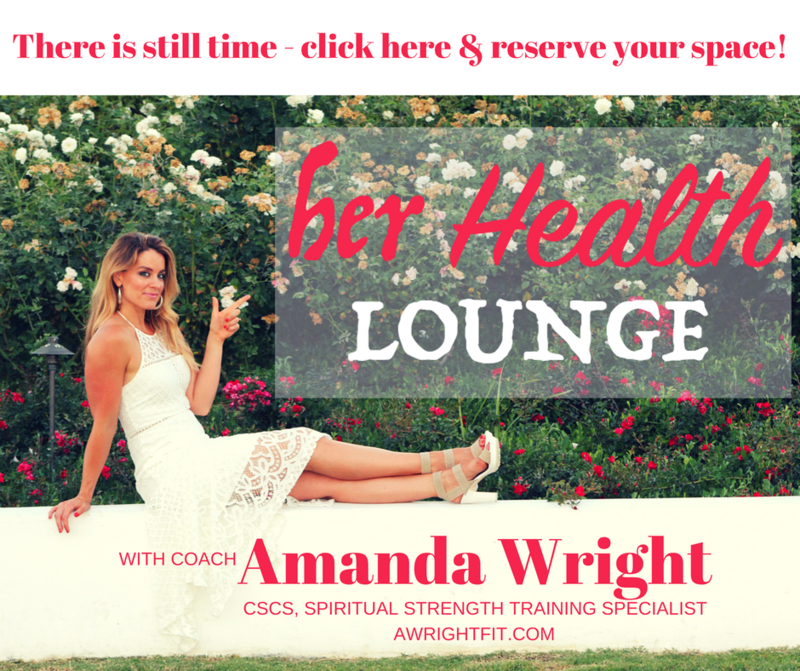 In the her Health Lounge we will spend the first couple of weeks together practicing what I call “Visualizing her.” It is IMPERATIVE that you can clearly envision what you want to accomplish through the practice of taking care of your health. This is what will help you make a PLAN. Plans are powerful! However, I see women all over the world misunderstanding this concept of “visualizing her” success and it has them spinning wheels in endless cycles of exhaustion. Are you VISUALIZING YOURSELF? Or do you envision yourself living or being like someone else that you idolize? Let’s be honest ladies, it is really easy to compare ourselves to what we see others doing. This is not what God has designed you for. You need to be able to VISUALIZE her— meaning this woman that God has created YOU to be. With your body frame, your personality, your desires, your dreams, your experiences, your strengths and your weaknesses. What are you going to DO WITH IT once you have your fit and healthy body? Too often women fall short with this vision. They focus on the end result as if getting to that “weight loss” or “size 6” is the destination. No, your health is the ROAD to the destination. God is interested in your MISSION and your PURPOSE. You need to get clear on what you are going to DO once you get more energy from eating healthy; once you have a leaner frame and stronger muscles; once you have a pep in your step that comes from self-care and love. What is the PURPOSE that your healthier body will enable you to DO BETTER? This is a God given calling on your life. You must be ready and willing for the MISSION of your life, which is not all about you or your vanity. God is not interested in giving you anything if your character is not ready to sustain it. So you can bet that you won’t see changes AROUND you before you see them WITHIN you. You will see this a lot of my coaching on health habit formation and ritualization practices to allow you to ENJOY THE PROCESS of health. You cannot focus on what you DO NOT WANT TO DO in your health, you must focus on what you DO WANT out of life. What you think about GROWS, literally. Neurosciences now prove that when we think a thought over and over again, it actually grows a physical entity in the form of neurons in our brain. It takes 21 days of neuron growth to form a true MEMORY. It takes 63 days to then have the memory form a HABIT of something you do without having to think about it too much. Not only do you need to focus on new behaviors, but you also need to focus on God. There is a spiritual term used for God which is to “MAGNIFY Him.” When you dwell on all that GOD IS and all the God can do, your problems and your faults and flaws naturally dissipate and become irrelevant. What you think about GROWS! This is why spending time daily with God and surrounding yourself with women who also encourage your spiritual growth is one of the BEST ways that you will stay focused on your journey! It’s not going to be easy. Growth never is. Part of your journey is likely pulling out a lot of lies that serve as the weeds surrounding and choking the dreams of you health. To get more information on the her Health Lounge program, please click HERE to take a look at the sales video and the page of details provided. The program starts on Monday, September 12! This week, you can also a Discovery Call with me HERE!